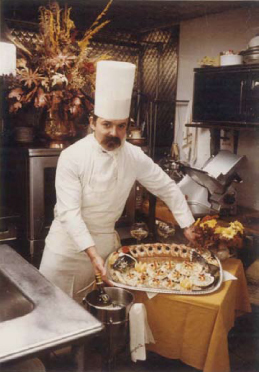 Jean-Jacques Gabrillargues, founder of Jean-Jacques' Culinary Creations, was born in Paris, France. He received his culinary education and training at the Ecole de la Chambre de Commerce et d'Industrie de Paris. Before establishing Jean-Jacques' Culinary Creations in 1988, he was head chef at various renowned restaurants in Paris and New York. He is a certified executive chef and a member of the American Academy of Chefs. Jean-Jacques' Culinary Creations is a family-owned company. Jean-Jacques' son, Jens Gabrillargues, and daughter, Jeannette Gabrillargues Chacho, direct all aspects of the retail, wholesale, and catering division. In 2006, Jean-Jacques' catering division combined forces with Mary and Vinny Scelsi of Colonial Caterers. Together, they cater many of the weddings and special events. The Gabrillargues family and their seasoned staff of dedicated professionals are committed to impeccably executing every aspect of your special event.